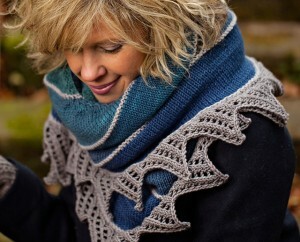 There’s no better way to ward off the winter winds than to wrap yourself up in a Plucky shawl. Frostline is a crescent shawl, knit in your favorite Plucky worsted weight yarn. We cannot decide which we love best, the SNUG Worsted version in a calming blue gradient or in Bello Worsted in a riot of colors!